I’ve recently been appointed as Computational Designer at Ravensbourne, which allows me to continue developing open source software for art and design and also teaching people how to make things using software (and programmable hardware). 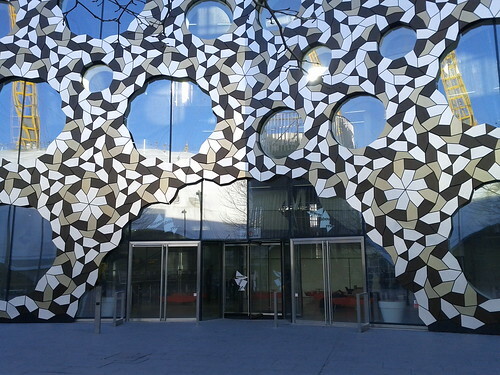 Just as in my TEDx talk about the need for teaching technology and creativity, Ravensbourne has graciously agreed that “Computational Art and Design,” as we’re calling it, are fast becoming sought-after skills for art and design students. Just look at websites like CreativeReview, CreativeApplications and CreateDigitalMotion to get an idea of what the community and industry are up to. What am I doing here? I’m working across all years and courses at Ravensbourne, helping to both inspire and guide students in using computational methods like programming in environments like Processing, Cinder, and OpenFrameworks (and many more) and using programmable hardware such as Arduino. It’s more than just teaching technology – I see computers and computing as a game-changed, a drastic shift in how we deal with the world around us that we haven’t seen since we learned to cook with fire about 800,000 years ago (give or take a few millennia). I’m at Ravensbourne two days per week, Tuesdays and Thursdays. On Tuesdays I host a “Code Lunch” AKA a “Coding Knitting Circle with Food” from 12:30-1:30 for students, with occasional guest speakers drawn from the local talent. On Thursdays I run a special, slightly more focused workshop on programming and computational design from 10:30AM-12:30PM where I go more in depth into concepts and methods. Monomatic (Nick Rothwell & Lewis Sykes), Noise Machine (Mick Grierson), pixelpusher (Evan Raskob) with computational design students from Ravensbourne and Transphormetic (Paul Prudence) present a series of real-time, code-based audiovisual works inspired by, interpreting and extending Whitney’s animated films – projected at large scale onto the rear wall of the P3 exhibition space throughout KAF ’12. Building on John Whitney’s aesthetic of simple dot and line, bold colour and dynamic geometric form they re-imagine his two- dimensional patterns in new forms: three- dimensional shapes, projection-mapped patterns and even anaglyph 3D. Some also take the next step of creating sound and music to correspond directly to those visual images – something John Whitney himself never managed to realise. I’ve been pretty heavy on the Google tools, partially as an experiment to see how they measure up, and partially to take advantage of G+’s great new “Hangouts with Extras,” which sounds like something you do with your dodgy friends after a late night but actually is the best classroom-in-a-box I’ve come across: voice and video chat with multiple people, screen sharing (even single windows! and participants can also share theirs with the group), and shared note-taking that automatically gets shared ownership with everyone participating in the conversation. Clearly, this is a well-thought-out service that could be a Skype killer, except it is a little clunkier to create a hangout than to simply Skype or iChat someone.